Bakit Di Ka Crush Ng Crush Mo stars Kim Chiu and Xian Lim did a side trip to Paris last July 15 before going to London for a TFC Barrio Fiesta show slated July 20. The two happily made the rounds of Paris' tourist sites including the Eiffel Tower and Louvre. 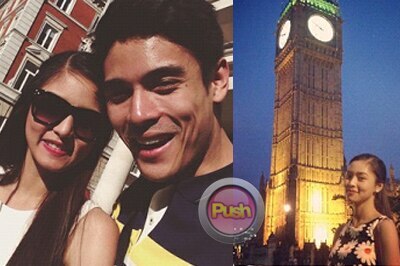 In London, the two also did a sightseeing tour of the city. They also met up with fans of their tandem before and after their show. Below are pictures from Kim and Xian's Instagram account.